Knowledge - 19 Things (and counting) I've Learnt About Filmmaking. When you start filming you learn a load of stuff as you do with any new topic so I could easily have added another 5, 10 or 20 things to this list. I've tried to pick out some of the most notable things. After starting this as an article with a list of 5 things, I've found I want to add more, so now we're up to 19 points. I'm going to keep adding more information that I think is useful. 1. Lead in and lead out. Always allow a little time at the start and end of a clip to allow you to press start buttons to settle the camera and to allow you to switch off with the movement of the camera at the end of your required piece of filming. This makes editing a lot easier as you have more time to play with at the beginning and end of the clip. 2. My heartbeat is very powerful! I try to avoid hand-holding the camera as my heartbeat will cause it to move. You never see this when you view the clip on camera but when you see it at full size 1920x1080 for instance, the rythmic movement is obvious and unpleasant to see. Wherever possible I use a tripod or monopod to steady the camera. Perhaps the exception to that rule is when I'm panning, as somehow that movement seems to overcome the unwanted heartbeat movement. 3. Sound is so important. Watch a film with bad sound and you immediately relegate it to amateurish. If you want a film to look great, it has to sound great too. I use a combination of recording sound in-camera or separately on a Zoom recorder but always with a quality microphone attached. I use the Rode VideoMicPro for this. Audacity has been a mini-revalation for me. A free piece of software that allows me to work on a sound clip and mix it with others with ease. There's so much documentation about this program online too so I've yet to come across an edit I can't do with it. I also use a lavalier microphone for interviews and I'm amazed at how much ambient noise they don't record but do pick up the voice of the interviewee very well. I have recorded interviews very close to lanes of noisy traffic and the mic has done a great job not recording that unwanted ambient noise. It helped to have the person's back to the traffic, with the mic attached to the person's chest area and shielded from the unwanted sound very well. 4. Syncing music to film. When you synchronise the change of a clip and the pace of the subject to the general beat of the music it becomes very pleasing to watch. Here's an example from a Cyclo-cross event. 5. Shorter is better than longer. The attention span of the average Internet user would appear to be quite short so a film that's 10 minutes long is likely to be too challenging to watch all the way through. 5 minutes is perhaps the longest a short film should be if you want the viewer to have any chance of making it to the end. Of course making it interesting to the end helps. In my latest short about designer/illustrator Nick Chaffe I wanted to do something interesting with the end credits so we made the creation of those end credits the core of the film. Nick designed them from scratch and this featured throughout the film with a reveal in all their glory right at the end. Of course now I have to think of a new way to make the end a little more interesting.. Blooper reel anyone? I should point out here that I'm referring to short films, not movies. The film about Nick is here. 6. Sloping horizons ruin a clip. I have had to bin clips because the horizon just isn't straight which is heartbreaking at times because it's usually the one piece of film you want to include. I don't make this mistake very often now because I don't want to feel that pain again. I use the built-in level of the Canon 5Dmk3 or the guide grids that display i filming mode. I also have a hot-shoe spirit-level but I don't use that much now. I've never used the bubble-levels on my tripod as I can't seem to get that pesky bubble in dead-centre. I also carry a carpenter's spirit level for when I want to pan a shot. That's because the tripod has to be level at the start of the pan to the end. 7. End a scene with movement. If you have a scene where someone is walking out of that scene, do not end the edited clip with the empty scene, cut to the next scene with that person still in the frame, but walking out. Another example would be where a car is driving through the scene, end the clip with the car still in the scene and not having left it. 8. Long lenses move in the wind. I use the Canon 80-200mm lens a lot but it does seem to catch the wind very easily. 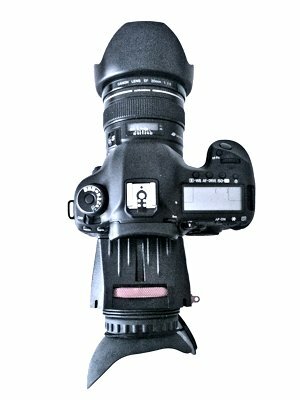 This is even when it's mounted on a sturdy tripod with a video head and using the tripod collar that fixes the lens to the tripod. I don't know how to really stop this issue at the moment but at least knowing about it means I can be careful when filming with it in the wind. Check your equipment before starting, that is, ensure it's working, that batteries are charged and that settings are as they should be. I.e. is the frame-rate at your required setting, quality at 720, 1920 or 4K, is the sound recording? Do quick tests before the real takes. 10. A film should have a start, a middle and an end. Is that a '3 act play'? I don't know, but I like to have scenes that open the film, followed by the main components that tell the story and finally closing scenes. This applies to even my smallest productions which might just be a collection of action from a sporting event. This isn't a hard and fast rule however, there are obviously times when an alternative approach can be taken, it's just that a lot of thought has to go in to how that works. Somehow, the start, middle and end thing works very well. If I'm making a film with an interview, the story from this is more than likely going to drive the content of the film. It's therefore important to have the footage to go with what's being discussed. This means doing the interviews first to identify what footage has to be gathered to make the film and footage work together. Lets give a quick example of hwo this works. We're interviewing a farmer specifically about feeding his cattle on his farm, the person watching the film is going to expect to see shots of that farmer feeding the cattle. If the footage was shot before the interview and the only feeding taking place was the chickens, then the film is going to be missing an important visual. Do the interview, identify the key factors from that and go film them. 12. Never under-estimate how long it takes to edit. Editing is a huge part of putting a film together and no matter how good your footage is, bad editing will ruin everything. It always amazes me how long it takes to do an edit. The time spent doing this is far more than just finding clips and joining them together, it's about reviewing all of the footage and sound, selecting the best and most important parts, picking the best music to work with the film, working out in what order to place them, tuning each clip for contrast, exposure, white balance, sharpness and colour-grading. Then there's the time to render, review and tweek the film, maybe a few times until it's really right, not just ok, but really, really right. 13. When changing camera angles for the same scene, the sound must sync. When filming the same scene but from different camera angles, the sound and footage must be edited such that the sound is seemless across the cut between the two scenes. The footage should be cut such that the sound in the next clip works with the sound from the last. Using an example, a person chopping wood, by ending the first clip with the arm raised, the second clip from the different angle should start with the arm about to chop, where there is no chopping sound. If the first clip ends with the chop, the second clip can't start with the chop. That's because the viewer is expecting the rhythm of wood being chopped so the edit has to reflect that sound. Two chops close together would not sound right. 14. Show the viewer what's being discussed in the voiceover. Let's start with an example. If the narrator is talking about a specific car, don't show the wrong car. It leaves the viewer wondering why they are looking at something that isn't being talked about. Of course the wrong car could still be shown in the film, just in the right context, if reporting on a car show for instance, that other car might make perfect B-roll filler to give the viewer a better idea of the cars being displayed. 15. Organise those sound clips. If sound is being recorded separately from the video (which if at all possible it should be and to be super-safe recorded in camera too to ensure there's at least one audio track), then trying to edit the clips after a shoot will be very tedious unless there's some way of lining up the audio clips with the video clips. I will speak the number of a video clip so it's recorded at the start of the audio clip. Always ensuring that I'm not crashing the required audio. Obviously that start clip must be part of the wasted recording but it will mean the editor knows exactly which audio belongs to the footage. 16. Have a storyboard before filming. Actually it doesn't have to be a storyboard it can just be a vision in the mind as to what the film will look like at the end. A storyboard does make this easier though as the process of writing and drawing it out will mean the finished item can be easily imagined and any faults identified. It will also provide a list of shots to get. This is all about planning. 17. Don't let editing fatigue ruin your film. After editing a film for hours or days, reaching the end and viewing the latest and hopefully final version is always a relief. It's very easy to get excited about showing the film to the world and publishing to YouTube or Vimeo. At this point though I resist the temptation to make it available online by leaving the film to 'cool' for a day or so. I then rewatch it with the intention of finding those last little niggling edits that are 'not-quite-right'. These are the pesky little errors missed because of editing fatigue after spending hours toiling over a hot keyboard and mouse. When seen with fresh eyes they stand out, so better to spot them and correct than to see them after publishing. Filming scenes over a number of days can mean whoever is in front of the camera will invariably turn up in different clothes over the course of the shoot days. Sometimes this won't matter but there will be times when this difference will spoil the story. Continuity doesn't just apply to clothing. If similar scenes are filmed in different light, say one scene is filmed in natural light and a related scene is filmed in artificial light, this will look odd and confuse the viewer. Remembering to keep a track on continuity can save a lot of heartache for the editor later on. 19. Same scene, different angles. This won't apply to all filming, especially when working with a script but for some of the types of work I do, then it's very helpful to have the same scene recorded differently. Let me give you an example. If I'm shooting a sports profile, I use a lot of shots of the sportsperson doing their thing with fast cuts between the scenes. I like to take a piece of footage which might show the athlete moving in one direction and follow it with another clip where the athlete is moving in a different direction. This adds a bit of drama. So I might want to use a particular bit of footage because it works well with one that preceded it but it has to fit with the direction too. If I've filmed the scene in different directions I give myself more opportunities in the edit. This does mean some things I film aren't used but I like to have more options than too few.